Palmbeach Jewelry Men's Oblong Genuine Onyx 14k Gold-plated Masonic Bracelet 8"
Palmbeach Jewelry Men's 1.70 TCW Genuine Onyx and CZ 14k Gold-plated Bracelet 8"
Gemstones: Matte Black Onyx (8mm). Style: Beaded (On. 08mm strong & stretchy clear elastic cord). Handcrafted Gemstone Bracelet. Handcrafted with Natural Gemstones. Bracelet fully customizable. FREE Customizing! Gemstones: Matte Black Onyx (10mm) and Hematite (10mm). 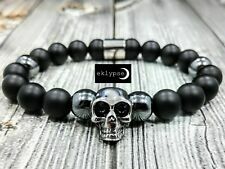 Premium Skull Collection. Style: Beaded (On 1.0mm super strong & stretchy clear elastic cord). Add this beautiful piece to your wardrobe. Dress it up for special occasions. Bracelets Size:7" to 7.5". Beads size:8mm. Gemstones: Matte Black Onyx (10mm) and Matte & Polished Hematite (10mm). Style: Beaded (On 1.2mm super extra strong & stretchy elastic cord). Handcrafted Gemstone Bracelet. Add this beautiful piece to your wardrobe. Gemstones: Matte Black Onyx (8mm). Style: Beaded (On 1.0mm super strong & stretchy elastic cord). Add this beautiful piece to your wardrobe. Dress it up for special occasions. Handcrafted with Natural Gemstones. Matte Black Matte Onyx & Black Lava Stone. Item Type: Beaded Bracelet. Materials:Natural Stone. Gemstones: Matte Black Onyx (10mm), Matte Hematite (10mm) and Magnetic Hematite Accents. Skull Collection. Style: Beaded (On 1.0mm super strong & stretchy clear elastic cord). Handcrafted Gemstone Bracelet. Handcrafted Men's Gemstone Bracelet Add this beautiful piece to your wardrobe. 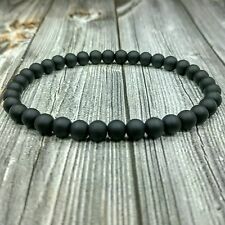 Great bracelet for everyday use. Dress it up for special occasions. Makes a great gift for yourself or for a special someone. Handcrafted with Natural Gemstones. Bracelet fully customizable. Just send a message with desired length before purchasing. FREE Customizing! 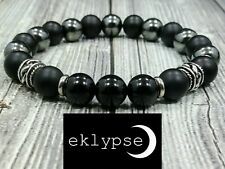 Details: Style: Beaded (On 1.0mm super strong & stretchy clear elastic cord) Gemstones: Matte Black Onyx (10mm) Size: Approx 8" Long Metal: Stainless Steel Shipping: FREE SHIPPING! USA only. Sorry no international shipping. If you have any questions please feel free to ask. Thanks for looking! David Yurman. 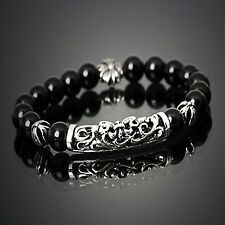 Spiritual Bead Bracelet w/ Onyx and Black Diamonds. Bracelet is in Sterling Silver. 925 w/ onyx & black diamonds beads. DY pouch is included.Notes. 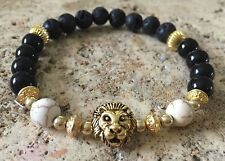 For Sale We Have a 14K Solid Yellow Gold Panther Link Onyx & Diamond Bracelet. Bracelet is in good condition with minor signs of previous wear, Including one repaired link and some links that have been stretched due to wear which I provided photographs. Weight is 19.6 grams. Diamonds have been tested and are guaranteed to be 100% Natural/Real. 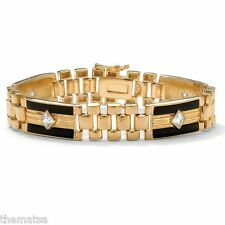 Marked 14K and tested, Bracelet is made of 100% 14K Solid Yellow Gold, NOT PLATED OR FILLED. Please see photos for more details, If you have any questions regarding this item please feel free to ask. 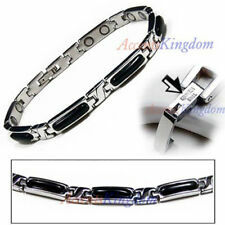 We accept returns in 30 days if you are not satisfied with bracelet. Thank you. A tiger concentrates on its desires. 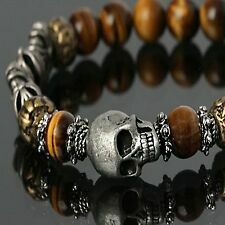 Tiger's Eye is a stone of protection that is also very grounding. It enhances integrity, willpower, practicality and correct use of power. It is a stone that enhances good luck, and brings prosperity, often in the form of money. Gemstones: Matte Black Onyx (10mm). Style: Beaded (On 1mm super strong & stretchy elastic cord). Handcrafted Gemstone Bracelet. Handcrafted with Natural Gemstones. Bracelet fully customizable. FREE Customizing! 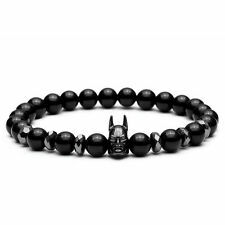 The bracelet has17 Genuine Onyx beads each -12mm in size. 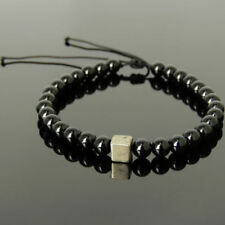 A simple design with AAA Top Quality Onyx beads –. Gemstones: Matte Black Onyx (10mm) and Lava (10mm). Style: Beaded (On 1.0mm super strong & stretchy clear elastic cord). Handcrafted Gemstone Bracelet. Add this beautiful piece to your wardrobe. Dress it up for special occasions. 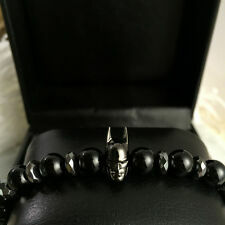 New ListingStainless Steel Dragon Head with Black CZ Eyes in Onyx Bead Bracelet 8" to 9"
Highly Detailed Surgical Grade (316L) Stainless Steel Dragon Head with Black CZ Eyes in a Polished Black Onyx Bead Bracelet. Adjustable from 8" to 9" with an easy double sided pull string that has smaller polished onyx beads attached. Gemstones: Matte Black Onyx (10mm). Style: Beaded (On 1.0mm super strong & stretchy clear elastic cord). Add this beautiful piece to your wardrobe. Dress it up for special occasions. Handcrafted with Natural Gemstones. Gemstones: Matte Black Onyx (8mm) and Black Lava (8mm). Zen Collection. Style: Beaded (On 1.0mm super strong & stretchy clear elastic cord). Handcrafted with Natural Gemstones. Bracelet fully customizable. Gemstones: Matte Black Onyx (10mm). Style: Beaded (On 1.2mm super strong and stretchy elastic cord). Handcrafted Gemstone Bracelet. Add this beautiful piece to your wardrobe. Dress it up for special occasions. Material:Natural Matte Onyx & Blue Tiger Eye. Size: 8mm beads, 17cm in circumference, elastic circumference. 3、Natural stone itself is flawed, a small amount of crack, which is the basic characteristic of natural stone, is what we call beauty flaw, so do not make a fuss, oh. Gemstones: Matte Black Onyx (10mm). Style: Beaded (On 1.0mm super strong & stretchy elastic cord). Handcrafted Unisex Gemstone Bracelet. Add this beautiful piece to your wardrobe. Dress it up for special occasions. Gemstones: Matte Black Onyx (10mm) and Brown Tigers Eye (10mm). Style: Beaded (On 1mm super strong & stretchy clear elastic cord). Handcrafted Gemstone Bracelet. Handcrafted with Natural Gemstones. Bracelet fully customizable. Gemstones: Matte Black Onyx (10mm). Style: Beaded (On 1.2mm super strong & stretchy elastic cord). Add this beautiful piece to your wardrobe. Dress it up for special occasions. Handcrafted with Natural Gemstones. Gemstones: Polished Black Onyx(10mm), Lava (10mm) and Matte Black Onyx (10mm). Style: Beaded (On 1.2mm super strong and stretchy elastic cord). Add this beautiful piece to your wardrobe. Dress it up for special occasions. 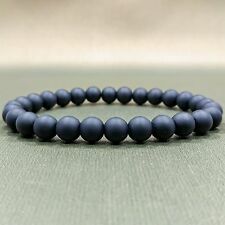 Matte 10mm Round Genuine Onyx Beads. Matted beads as to not be too shiny. Stretch 10mm Natural Round Beads. Double Stretch cording for extra durability. 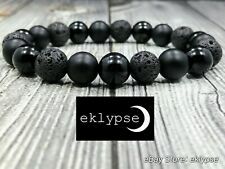 Genuine Black Onyx Bead Bracelet for Men or Women On Stretch 6mm AAA - 7.5"
The bracelet has30 Genuine Onyx beads each -6mm in size. A simple design with Top AAA Quality Onyx beads. 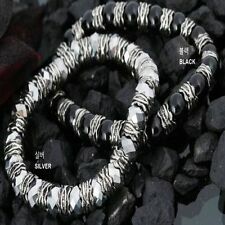 It is beaded on BLACK stretch cord.